End presidential term limits, are you insane? 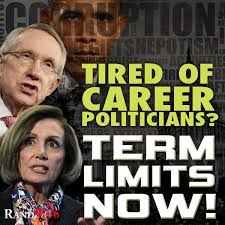 We should implement US House and Senate term limits as well. In what might be one of the most foolishly thought out premise, NYU history professor Jonathan Zimmerman inked a WAPO oped titled “End presidential term limits,” suggesting that the 22nd Amendment limiting presidents to two terms of office should be repealed as a way to assuring a more effective presidency and protecting democracy from a leader without fear of voters’ wrath. Why is it so important now, because Barack Obama is president? Hell, it’s not like he follows the US Constitution now, watch him run for a third term anyhow and call those oppose racists. Sorry, but if our countries first president, George Washington, thought multiple terms was a bad thing, that is good enough for me. As it was Washington had to be talked into a second term. Ending term limits was wrong when it was discussed by Republicans during the presidency of Ronald Reagan, it was wrong when Democrats brought it up with Bill Clinton and it is still wrong with Barack Obama. The office of the President is bigger than any one man, that includes Obama. There is a reason why America fought a War of Independence against King George and it was not to replace one tyrant with another. I’ve been thinking about Kilgore’s comments as I watch President Obama, whose approval rating has dipped to 37 percent in CBS News polling — the lowest ever for him — during the troubled rollout of his health-care reform. Many of Obama’s fellow Democrats have distanced themselves from the reform and from the president. Even former president Bill Clinton has said that Americans should be allowed to keep the health insurance they have. Nothing to fear eh, what would you call the approval rating in the 30′s and the panic that Democrats are presently experiencing? Also, Zimmerman says, “If he [Obama] chooses, he could simply ignore their will.” Just curious, when did Barack Obama or Democrats ever care about the will of the People? That being said, not only should the 22nd Amendment not be repealed, there should be term limits for Senators and House members as well. As a matter of fact there should be a limit as to how many years that some one can serve in over-all political life. These people need to understand who they work for and the laws they pass will eventually effect them too. That does not happen in today’s politics.